While iPhone users tend to have an “Android stigma”, one thing is certain, pretty much everyone uses Google’s apps in some way or another. As an iPhone user, I actually prefer Google’s browser Chrome to Apple’s Safari. And let’s not forget to popularity of Gmail, Google Maps, and YouTube. Recently Google continued to narrow the smartphone divide between Android and iOS users by releasing an incredibly user-friendly, iOS-only keyboard: Gboard. The stock iOS keyboard is admired by most iPhone and iPad users. They are proud of the basic yet functional nature of the keyboard; the touch sensitivity is spot-on and glitches are few and far between. But as more third party keyboard apps such as Swype have become increasingly popular, iPhone users are starting to open up to the idea of a new smartphone keyboard. 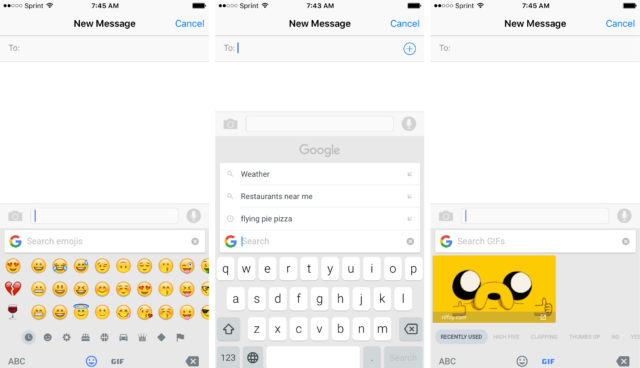 Google’s Gboard is an iOS only keyboard that includes some extremely useful features modeled after the conveniences of already existing third-party keyboards. It allows users to easily find GIF’s for text message, reactions and seamlessly search through the sea of emojis that exist. Most importantly Gboard integrates a Google search bar directly into the keyboard. After using Gboard for a couple of weeks, I’m convinced that many of these features are crucially time savers. It’s like I never knew I needed these but I’m already realizing how much time was wasted before. I was constantly switching between my iPhone’s Internet browser and text messages as a means of relaying information to someone via text. Fortunately, there’s an integrated Google search bar within Gboard. This means that it’s no longer necessary for iPhone users to navigate away from the text message screen to look something up on Google. The ‘G’ icon is smack dab in the center of everything, which makes the process of googling a fact or getting Google Maps directions a smooth one. It’s also possible to copy/paste information from those search results directly into texts. It doesn’t matter whether you’re looking for a photo, meme, or GIF or whether you’re texting, emailing, or tweeting. Gboard is all inclusive in these regards! I really recognized its full potential when I set Gboard to default on my phone. This is a basic feature but in my opinion it’s actually quite groundbreaking. With every iOS update there seems to be new additions to the massive list of colorful and diverse emojis. GIFs can also be pasted right into text messages. I love to use these as humours reactions to things my friends and family say. I was previously searching for these through my phone’s browser which was also overly time consuming. Thankfully this wasted time has subsided. It’s literally that simple. In a matter of seconds you can play around with this new keyboard! The settings in Gboard allow you to switch many options off and on. Glide (SWYPE) texting, emoji suggestions, auto-correction/prediction, and swear word censoring are all selectable and customizable. Android users need not fret, because there are rumors that Google is looking to add Gboard functionality to Google’s Android keyboard soon. Many people agree that common issues with iPhones are subjectively less frequent than Android phones. However a common counterargument is that the iPhone refuses to ‘play nice’ with other non-iOS devices. This is a large reason why the collaboration of Gboard can be viewed as a progressive step forward–one day the smartphone device may dwindle. Preferences aside, this much is certain: when Apple’s leadership and practicality meet Google’s ingenuity and attention to detail, the byproduct is something beautiful. This is certainly the case with Gboard. Even if you’re a die hard Apple fanboy, spice up your tech life and give Gboard a shot! You won’t regret it!